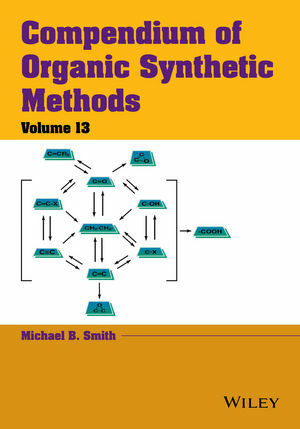 The Compendium of Organic Synthetic Methods serves as a handy desktop reference for organic chemists to browse new reactions and transformations of interest, facilitating the search for functional group transformations in the original literature of organic chemistry. Volume 13 contains both functional group transformations and carbon-carbon bond forming reactions from the literature in the years 2005-8. It presents examples of published reactions for the preparation of monofunctional compounds. Michael B. Smith is a Professor of Chemistry in the Department of Chemistry at the University of Connecticut. He is the lead coauthor of the fifth and sixth editions and author of the seventh edition of March's Advanced Organic Chemistry and the author of the previous 6 volumes of the Compendium of Organic Synthetic Methods (Wiley) as well as several other monographs. Professor Smith is the author of 23 books, including monographs and textbooks at both the graduate and undergraduate level.